Miss Do you own Microsoft? 27 Mar Miss Do you own Microsoft? As an aside to Myinternalrecruiter.com I do some consultancy for 365edu who organise Education technology events around the world. 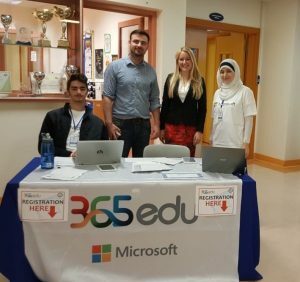 Last weekend I was in Doha, Qatar for the 1st 365edu summit in the region. I helped organise the event and the attendees. The differences between Leeds and Qatar are enormous; the obvious weather…it is snowing in Leeds and 30 degress in Qatar, my whole house is the size of some of their doorways and there is no 5p plastic bag charge. The trip was not all plain sailing, no matter how much you plan things still go wrong. However, I have learned, when things go wrong people are willing to go above and beyond to help you for no other reason than you need help. These people knew they would most likely never see me again but when our caterer pulled out at the last minute everyone rallied around to help us sort it out and get another caterer. One of my highlights was working with the volunteer students, they were all so eager to help and honestly could not have done more or been more welcoming. It was a real privilege working with them. The next generation of leaders are currently in school and we need to do all we can to empower them and give them the skills they need to succeed in whatever path they choose. It is very humbling to sit with a group of students and hear their views on the world. What an inspiring story. I agree – leadership isn’t about telling people what to do. It cant be anymore and business doesn’t have to be about maximising your short term profit. Keep up the good work – worldwide ! Thank you. I completely agree, it has to be about long term relationships and choices.